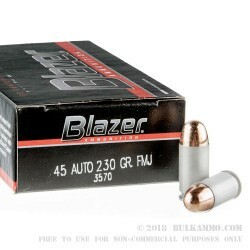 This .45 ACP ammunition from CCI's Blazer series delivers cost effective target shooting for 1911s and a variety of other pistols in this popular caliber. 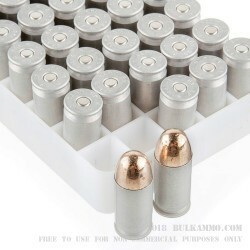 Each round in this bulk priced case of 1,000 fires a 230 grain full metal jacket bullet at a muzzle velocity of 845 feet per second, producing typical .45 Auto ballistics along with heavy but controllable recoil. Blazer ammunition is distinguished by its non-reloadable aluminum cases. These cases are not reusable but cost significantly less than Boxer-primed brass, making them a great choice for high volume range use. CCI ammo is loaded in Lewiston, Idaho using the company's own primers, which are known for their high reliability. These rounds use non-corrosive Berdan primers. Bought 1000 rounds to break in me and my wife's new 1911. The ammo shot fine, only had a few issues. One case didn't have the rib cut at the base to eject it but still shot. Expect to have a dirty gun after this ammo. Wouldn't hesitate to buy more, neither should you. High $$$ 1911 - Consistent performance & cleaner than expected, and satisfied with 4/1000 minor jambs. In comparison, this gun eats ammo: 1000's of re-manufactured brass FMJ rounds(only from the right places) to steel casing self-defense rounds without any issues. Same Blazer round in brass, not one issue in 1000+. It is the casing (AL). A loved and pampered "not out of the box" 9 or 45 Glock - What can I say, they eat sand or slop! An "out of the box" Glock - 2/~1000 improper seating of the round, so no boom. Out of Box, average pistol price, for occasional shooter - You will have jambs with (AL) casing, and will struggle when spring gets plenty of rounds on them (especially compacts). New spring will likely ram it home first 500+. I recommend same round in brass. Reliable, fast ship, great customer service. I train with nothing else. Many ranges only allow non-metallic ammo, so having a large supply of CCI aluminum is critical. Good ammo for the money. I have two 1911s both eat this ammo with no problems. Q: I am looking for non steel core ammunition. Is this ammunition steel core? A: Hello Michael, These 230gr. 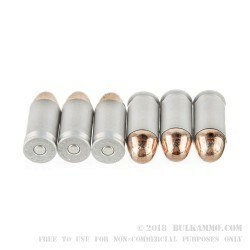 FMJ rounds by Blazer have a lead core and a copper jacket. These rounds do not have a steel core. A: This CCI ammo is not reloadable. The manufacturer uses a Berdan priming system which will not accept the priming tools found on reloading dies. For reloading needs, boxer primed brass works best. Q: Are there any known feeding issues with the aluminum cases vs brass? I know some 1911's can be picky but in general any issues? A: Not really. 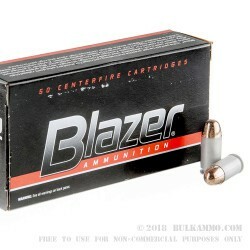 Blazer aluminum cased ammo is known to be very reliable across a wide spectrum of handguns. There are some imported pistols that have extraction issues with aluminum cased ammo, and the Thureon Defense carbines come with a recommendation against aluminum cased ammo because of feeding issues. However, if a 1911 is reliable with brass cased ammo, it should be reliable with aluminum cased ammo. It would be a good idea to test this with a small amount of ammo before ordering in bulk. A: Yes, this CCI Blazer ammo is made in the USA.